Tool sharpening is not an exact science. A grind that suits one turner is not necessarily the best for every one. To some extent, the way a tool is ground depends on the user. Nowadays, most people use grinding wheels for sharpening, though some turners still advocate the use of flat surfaces, like belts. The Robert Sorby ProEdge system is based on this approach. The basic difference between the two methods is that wheels produce a hollow grind and belts produce a flat grind. Since the angle of a grind produced with a grinding jig partially depends on the curvature of the grinding wheel, the grind will change if the wheel diameter is decreasing. The jig needs to be readjusted to compensate for wheel wear. 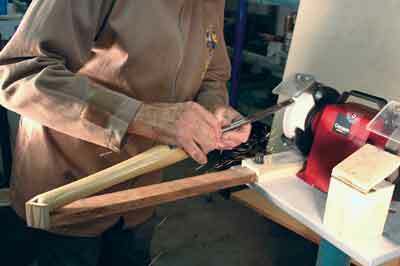 Jigs not only help the uninitiated to overcome the problems of free hand grinding. They will reproduce the same grind repeatedly while minimising tool wear. There are different jigs for different tools, and for different grinds. The same tool - a bowl gouge - would require a different jig for conventional or for swept-back grinding. 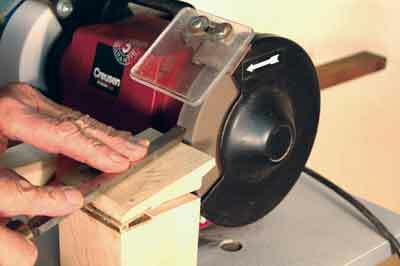 Tilting platform jigs - for chisels, skews and scrapers (conventional grinding of gouges). Handle tip or handle end jigs - for conventional grinding of gouges. Pivoting jigs - to produce a swept-back grind. 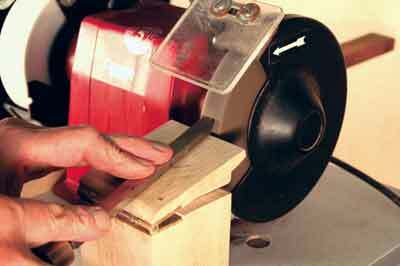 This article will help you to turn your grindstone into a system using all three types of jig described above. Grinders vary greatly. The jigs in this article are made for a 150mm (6in) wheel, 120mm spindle height and 160 x 110mm footprint. You might have to make some changes to suit your grinder. The platform is mounted on a hinge. Inserting a pre-cut wedge with an angle of your choice can change the slope. It is mounted on the base with a bolt in a slot. The distance between the platform and the grindstone can be adjusted by moving the whole assembly in the slot. This best suits chisels and scrapers. Take a 110mm high x 75 x 75mm piece of wood with a hinged lid 75 x 90 x 10mm. Drill a 5mm hole in the centre of the base, then screw and glue a length of M6 threaded rod in. This will fix the jig to the base with a penny washer and a wing nut. The slope of the hinged platform is set by inserting 20°, 30°, 45°, 60°, etc. wedges, as required. As the name suggests, the turning tool is placed in the grinding position, by the bevel touching the grindstone and the other end of the tool, the handle, is located at the end of the slide in the small 'V'. Make a sleeve from 12mm plywood to accommodate the slide, 40 x 20mm and about 750mm long. The sleeve is fixed to the base by wood screws from underneath. The slide must move easily, with very little slack. It is fixed in position with a thumb screw or similar. At the outer end a 'V' shape accommodates the tool handle. You sharpen the gouge by rotating it over the grindstone in both directions. 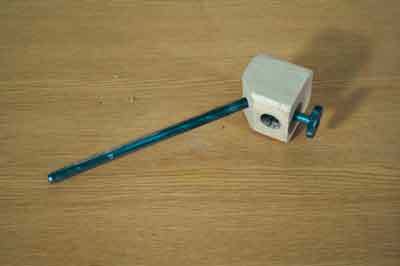 The pivoting jig is a block of wood with a metal - or wood - stem. The end of the stem is held in a fixed spot while allowing the tool - usually a gouge - held in the tool holder, to be pivoted over the grindstone. Commercial metal tool holders have a small square cage with one side adjustable for different gouge sizes. In this wooden version you can make two or three tool holders to suit the different gouge sizes. Take a piece of hardwood, about 45 x 45 x 50mm and drill three holes in it. The hole for the gouge is about 2mm larger than the diameter of the gouge it is for. The hole for the stem, about 130° between stem and the gouge - the stem is cut from 8mm steel rod, but you can use 8mm dowel - has to be a loose fit to allow for some epoxy to be applied. If it is too tight, the wood will wipe the epoxy off when inserting. The third hole is the 'tool fixing hole', which will be tapped M6. This jig is mainly used for bowl gouges. On spindle gouges, the wings are not brought back as far as on bowl gouges. However, this can be easily achieved if you make a tool holder with the stem 145° instead of 130°.